Compatible Epson T3591 35XL Black. Replaces Epson T35XL Padlock Cartridges. Premium Compatible Epson T3593 Magenta. Premium Compatible Epson T3594 Yellow. The Epson WorkForce Pro WF 4720DWF printer is a cost-effective 4-in-1 colour printer which can print, scan, copy, and fax the documents. The printer provides hassle-free performance with high capacity input tray and high-speed, wireless printing options. This inkjet printer has physical dimensions of 475 x 435 x 315 mm and 11.12 Kg weight. The printer is backed with a stylish, sleek 6.8cm touchscreen LED for flawless navigation. The WF 4720DWF printer uses Epson’s PrecisionCore technology to provide good quality, crisp printouts. This workforce printer offers 4,800 x 1,200 dpi printing and copying resolution and 1,200 DPI x 2,400 dpi scanning resolution. As per the ISO standard, the printing speed of this workforce printer is 20 pages/min for monochrome and Colour prints. Thanks to its wireless connectivity options, the printer can print from wherever you are. In addition, NFC is available with a simple tap on the compatible wireless devices. Also, Epson's free mobile printing apps including, Email print which allows you to send items to print from almost anywhere. Multi-functionality printer which can print, scan, copy, and fax the documents. Low running cost with XL Epson WorkForce Pro WF-4725DWF ink cartridges and DURABrite Ultra Ink. The Epson WorkForce Pro WF-4725DWF printer reduces your printing task burden by providing business-quality prints. To add more crisp in a cost-effective way, one can use XL size Epson WorkForce Pro WF-4725DWF ink cartridges. Auto duplexing, borderless printing, touchscreen LED screen are some of the core features of the Pro WF-4725DWF printer. The printer is a bit bulky printer with a pleasing appearance, which looks good on your office desk. How can a window user conserve black ink when Epson WorkForce Pro WF-4725DWF ink cartridges colour level is very low? Window users have the benefit to save the black ink using the “conserve black ink” feature. Step 1: Ensure that the plain paper is selected as the paper type. Step 2: For paper & quality option in the advanced tab, choose Normal. Step 3: Each time you try to print, a window will appear asking you for using “black ink” or “conserve black ink by mixing colour ink” from colour ink cartridges. If you choose the continue option for conserve the black ink, then colour ink will be used instead of black ink. But, if you choose the printing option with black ink then the ink level of Black Epson WorkForce Pro WF-4725DWF ink cartridges reduces. Step 4: Each time you try to print, this window will appear. You can make the selection according to the ink level in the ink cartridges. Step 5: It is recommended to replace the expended Epson WorkForce Pro WF-4725DWF ink cartridges as soon as possible, with the new ones. How to load paper in a paper tray for Epson WorkForce Pro WF-4725DWF printer? Step 1: Pull out the paper tray completely out of the printer machine. Step 2: While pressing the paper guide, release levers and slide the paper guide to fit the paper you are loading in a tray. Make sure the guides are firmly placed in the slots. Step 3: To avoid any paper jam or misfeed, fan the stack of paper properly. The paper is below the maximum paper limit, as overfilling will cause paper jam issue. The side to be printed on should be face down in a tray. The paper guide must touch the side of the paper so, feed it correctly. Step 5: Put the paper tray firmly back in the machine ensuring that the tray is completely inserted into the machine. Step 6: Lift the support flap up to prevent the paper from sliding off the face-down output tray. Q. What do you mean by ADF? A. ADF stands for Automatic Document Feeder. Printers that have an ADF, make it very convenient for users to print multiple pages at a time, as you do not have to place each sheet of paper individually into the machine. Epson WorkForce Pro WF-4725DWF printers come with an ADF that can handle up to 35 pages. Q. I am very hesitant to use compatible ink cartridges for my Epson WorkForce Pro WF-4725DWF printer, as it advises against the use of compatibles. I want to lower my operating costs but I do not want to damage my printer. A. You do not have to feel hesitant about buying our compatible Epson WorkForce Pro WF-4725DWF ink cartridges, as they will work extremely well with your printer. All our compatible ink cartridges are high quality cartridges and have undergone various tests in order to provide our customers with the best ink cartridges. Q. Are Epson WorkForce Pro WF-4725DWF ink cartridges available in other colours as well? A. Epson WorkForce Pro WF-4725DWF printers use 4 colours for printing, black, cyan, magenta and yellow. These 4 colours are primary colours and together, they can create all other colours. Q. How many contacts can I save in the address book for faxing? 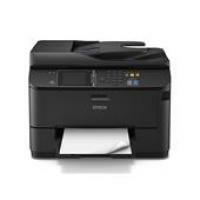 A. Epson WorkForce Pro WF-4725DWF printers can store up to 100 entries in the address book. Q. I recently ordered a pack of cyan Epson WorkForce Pro WF-4725DWF ink cartridge for my printer. However, the ink cartridge is defective and is not functioning properly. Can I get a replacement for this? A. We apologise for the inconvenience caused to you. We do arrange replacements or refunds for all the faulty items. Please contact our customer support regarding this issue and also provide us with your order details. We will get a replacement for you as fast as possible.